Rideau Carleton Raceway Buffet is usually a good bet! Ok, it IS organic but at $3 per cup is it really fair trade? Cauliflower Cheese, a great replacement for mac’n’cheese! Many meals claim to be ready in 5 minutes, this one delivers! Last Sunday, Dorothy came home with a delicious-looking head of cauliflower. From the second that I laid eyes on it, I knew what its fate was to be. Now I will be the first to admit that I do not find the thought of being a vegetarian particularly appealing. I like meat! However, this is a meal that goes a long way to persuading me that I could make the switch if I had to. Apart from being extremely fast and simple to prepare, it is also filling, nutritious and delicious! This is one of those recipes that I have retained from my early childhood and is included in our upcoming Un-Cookbook. The only real modifications that have occurred over time are twofold: 1. I no longer cook my cauliflower on the stove-top, since the microwave is faster, creates less heat and uses less electricity. As an additional benefit, there is little or no loss of nutrients. 2. In my childhood, regular cheddar cheese was just about the only type of cheese that was ever on hand in the kitchen. Today, we typically have 3 or 4 different cheeses in the fridge. Below is our Un-recipe. If you followed our link above, you will already know that I do not use recipes and therefore cannot give exact amounts, since I usually improvise. That being said, I recognise that not everybody is comfortable with winging it, so I have attempted to add quantity guidelines. Please recognise that they are only that! The Ingredients: All you need is cauliflower, cheese, milk, flour or cornstarch and seasonings. Method: Break or cut the cauliflower into flowerettes (see picture above). Mix the flour or cornstarch (approx 1tbsp per 6oz of milk) with a little of the milk to make a paste. Then add the remainder of the milk and stir till well mixed. Place over a low-to-medium heat and stir in one cup of grated cheese(s). Add your desired seasonings. Personally, I added some Trinidad Green Seasoning and Barbadian Hotsauce as well as a little fresh-ground pepper. Bring this mixture slowly to the boil stirring frequently. While the sauce is cooking, place the cauliflower in the microwave. I prefer not to give fixed cooking guidelines here since all microwaves are different. For me, 3 minutes on high leaves 2 servings of vegetable still slightly crisp as we like it. 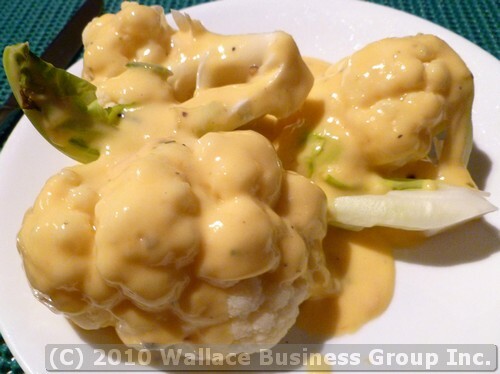 Arrange the cooked cauliflower on a plate and pour the sauce over the top. Served with fresh, crusty bread, no-one should feel the need for meat!